Dreams come true on the Amalfi Coast. They really do. How could they not when you wake up to sun beaming down on turquoise seas crashing into that famous coastline. And the Amalfi Coast towns are almost too perfect for words. When you are planning your vacation to this picturesque region of Italy, it is hard to choose where to stay so we created this guide to the best places to stay in Amalfi Coast. 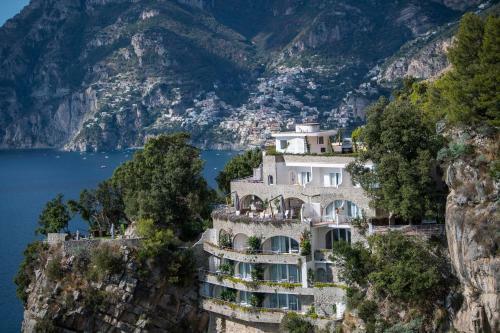 From bustling beach towns, to romantic hilltop villas, and tiny hidden coastal hamlets there is the perfect place to stay on the Amalfi Coast for you! Stretching 50 kilometres along Italy’s western coastline, the Amalfi Coast (Costiera Amalfitana) is an area of outstanding natural beauty and is listed as a UNESCO world heritage site. Soaring cliff faces, tiny coves and some of the bluest water you have ever seem give this region an otherworldly aura. So much so that several places along the coastline were used as the location for the mythical land of Themyscira in the recent Wonder Woman movie. The towns of the Amalfi Coast each have their charm too – whether you want glamor and glitz or rustic charm. First, get your bearings with this Amalfi Coast map. As you can see, the towns stretch along the coast between Sorrento and Salerno. Use the table of contents to choose the town that suits you or simply browse at your leisure. At the end of the article there are some tips on how to get to the Amalfi Coast and getting around. Ahhh Positano! One of the most picturesque places on the planet, you can’t help but fall in love with this town. Its colorful, terracotta roofed houses perch on the cliffside and seem to cascade down to the water. 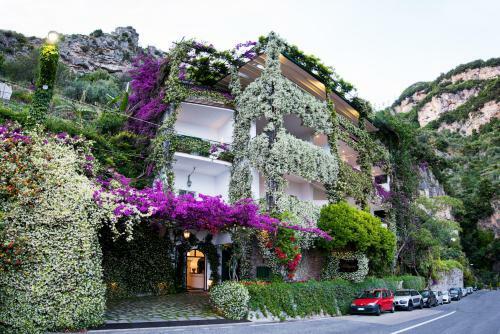 Positano is known for its steep and winding cobbled streets and hanging wisteria. And of course its iconic beach front lined with vibrant umbrellas. Positano is the place for lazy breakfasts on a terrace taking in the magical views. It’s the place for browsing boutiques and galleries, lazing in the sun and long seafood lunches. And of course, the sunsets are nothing short of incredible. If you can tear yourself away from Positano itself, it is a useful base to explore the Amalfi Coast by boat or take a day trip to the beautiful island of Capri. The perfect spot for a honeymoon, Positano will best suit couples looking for a romantic getaway. But consider also, such beauty inevitably attracts big crowds. Most visitors come for the day and leave before sunset but if you are looking for a quiet town Positano is probably not the place for you – particularly in summer. Note that the streets are very steep and there are lots of steps so do consider this if you are traveling with small children or have mobility issues. There is no easy way to get to the upper parts of the town without walking. Lastly, Positano is not a budget travel destination. If you want to secure the best deals at the best hotels in Positano you need to book well in advance – at least 6 months. Everyone will tell you to stay at Le Sireneuse. It is one of the iconic hotels of the world. La Sireneuse is a luxury hotel known for its traditional yet elegant rooms, impeccable service and Michelin starred restaurant La Sponda. But most of all, people come to the hotel for its terrace with some of the most dreamy views in the world. If Le Sireneuse has no availability or is out of budget, here are some suggestions for your Positano escape. Hotel Poseidon is a traditional family run hotel with gorgeous views of the coastline. Boasting a pool and an outdoor dining terrace, the hotel is a perfect haven close to all the action of the town. 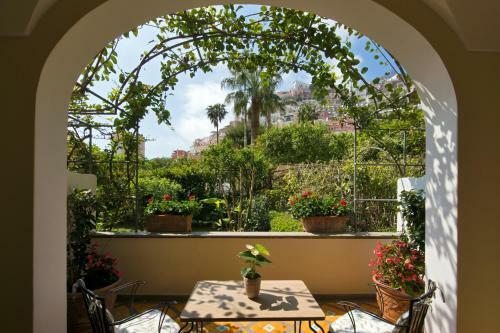 Set in a beautiful garden bursting with lemon trees, Hotel Palazzo Murat is a place of tranquility close to the center of Positano. The hotel has a pool and restaurant and is a short walk to the beach and ferry terminal. Just 2 minutes walk from the beach, Villa Rosa is one of the best budget hotels in Positano (although not budget in the traditional sense – budget for Positano!). One day I dream of take our whole family to the Amalfi Coast and spend a week or two vacationing in a luxury villa. Imagine breakfasting with views like this! Truly the stuff dreams are made of. This 8 bedroom villa has a pool, is decorated with beautiful antiques and has several lounge areas for relaxing. At the heart of the Amalfi Coast, the town of Amalfi is an excellent base for exploring this beautiful region. Once a maritime power to rival Venice and Genoa, Amalfi is a bustling seaside town with a pretty beach front and many restaurants and cafes. Thanks to its historic past, Amalfi has cultural treasures worth uncovering. The most impressive of these is hte cathedral, the town’s focal point. We loved strolling along the medieval cobbled streets and secret passageways that lead you there. Amalfi also has some of the best beaches on the Amalfi Coast. They are mainly stony but there are some sandy coves too. If they are too crowded, take the short walk to neighboring town Atrani with its laid back beach vibe. As the mid way point along the coastline, you can take day trips from Amalfi by boat to Capri and along the coast. Local buses are easy to find at the main port. They will take you along the coastal road and up into the hills to visit the villas at Ravello. There is a car rental agency in Amalfi if you want some more flexibility. More about driving the Amalfi Coast below. Amalfi is a great place to stay if you enjoy mixing up your beach time with interesting day excursions along the coast and exploring historical and cultural sights. The town is built into a cove and the surrounding hillside. Its streets are not as steep as those you find in Positano. So, if you are traveling with children or people who have limited mobility, Amalfi will suit your travel plans. If you are looking for modern luxury on the Amalfi Coast, Hotel Marina Riviera is a fantastic choice. The hotel has stunning views over the sea and Amalfi town from its terrace and outdoor pool area. 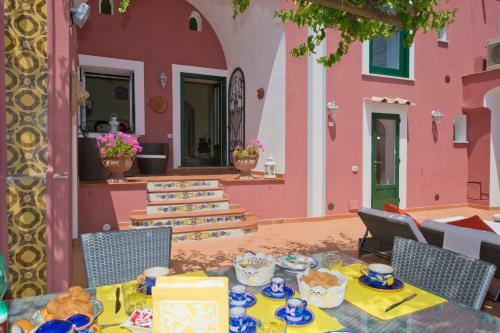 A charming bed and breakfast close to Piazza del Duomo, Residenza Luce is also a short walk from the beach and marina. The hotel is renowned for its hospitality – it is one of the most popular places to stay in Amalfi Coast. Parking is available close by at an additional charge. We had a wonderful stay at DieciSedici. 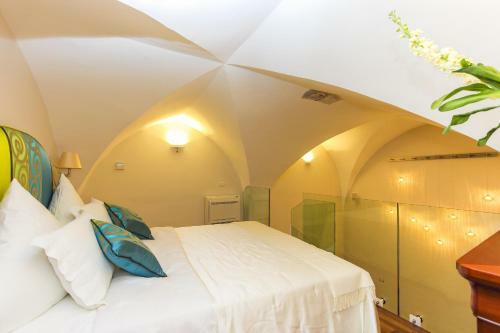 Set behind the cathedral in a quiet square, yet only moments from the harbour, this apartment style hotel is modern and beautifully decorated. Some of the rooms have sea views and/or a terrace – we had both! Breakfast is served at one of the cafes opposite the Cathedral – a quirky, yet fun touch. 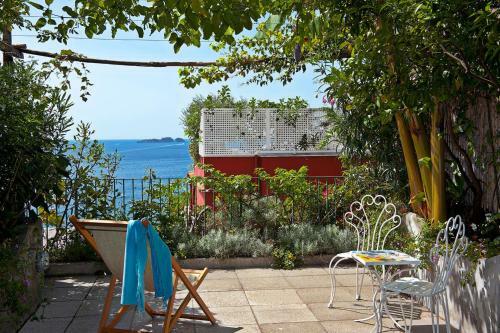 If you want to make the most of Amalfi town’s position on the coast and have space to relax from the crowds, this traditional villa checks all the boxes. Pretty Praiano perched on the coast halfway between Positano and Amalfi. With arguably the best views on the Amalfi Coast, from Praiano you can see the island of Capri in the distance. Imagine those sunsets! Praiano is a smaller, less busy town than Positano and Amalfi. There is no center, simply white washed houses scattered along the cliff. It is the town for you if you want a lazy beach vacation. There are several gorgeous beaches that get almost full sunlight the whole day. When you get hungry, stop at one of the many rustic trattorias to try the freshest seafood dishes on the coast thanks to the local fishermen. Try Trattoria da Armandino. Praiano is an ideal place to stay if you are planning to do the Il Sentiero degli Dei hike – Path of the Gods. The trail starts or ends there depending which route you take. For all its beauty, Praiano is a sleepy, tranquil town and it might not be the spot for you if you want a buzzy nightlife and shopping scene. Bear in mind that while the local SITA buses stop in Praiano they are often full from previous stops at the larger towns, especially in summer. Sightseeing and excursions are not as easy from this spot on the coast. Nestled into a cliff face, Hotel Piccolo Sant’Andrea is a beautiful luxury five star hotel decorated in contemporary style. With exceptional panaromic views from most guest rooms and its terraces, it may be difficult to tear yourself away. If you do, the hotel is just a nine minute walk from the beach. The hotel also offers its guests a free shuttle to and from Positano. Grand Hotel Tritone is one of the most popular hotels in Praiano. At this unique family run property you can swim in the swimming pool or at the hotel’s private beach. The hotel has a beachside bar and in house restaurant with a terrace featuring traditional local cuisine. A great value place to stay in Praiano Hotel Pellegrino is a friendly hotel with lots of charm. Rooms are air conditioned and decorated in traditional style, many with views of the coast. Guests enjoy home cooked breakfasts and meals with views from the shady terrace overlooking the sea. 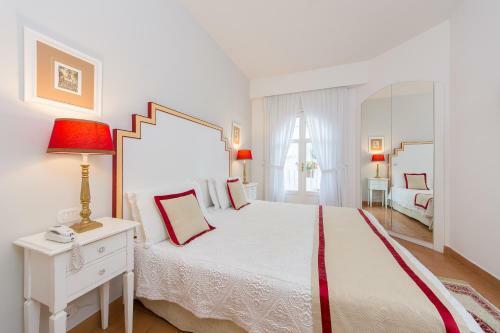 Palazzo Rocco has four bedrooms and can sleep up to 10 people in air conditioned comfort. 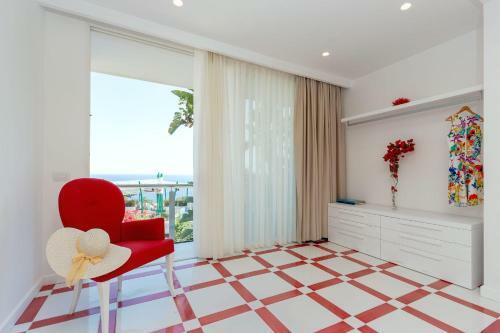 All bedrooms have sea views and there is large living room and terrace. If your budget doesn’t stretch that far, this 2 bedroom apartment offers spectacular views of the coastline at a fraction of the cost. Just a short walk along the coast from bustling Amalfi, the pace slows right down on the cobbled streets of Atrani. The smallest town in southern Italy, Atrani is the place to go for seaside breezes and respite from the crowds of the larger towns along the coast. A fishing village with lots of charm, the town is built on cliff edges. Houses and hotels are perched high on the hills and from them a raggle taggle of cobbled streets wind their way down to the seafront. Along the way are rustic cafes and restaurants serving up the catch of the day. Atrani has a sandy beach and its relaxed vibe means it is great for families and those detoxing from a fast paced reality at home. If you want to do some sightseeing, Atrani is on the major SITA bus routes along the Amalfi Coast and ferry transfers are a 10 minute walk away in Amalfi. In contrast to this rustic and historic village, Palazzo Ferraioli has contemporary styled and air conditioned rooms – most with sea views. The hotel has an onsite spa and hammam and an outdoor sun terrace with panoramic views of the harbour and sea. Perched 365 metres above the sea, Ravello is an elegant and historic town with swoon worthy views. Over the centuries, writers and artists were entranced by its picturesque landscape and regal villas. Notable former visitors include Truman Capote, D H Lawrence and Jacqueline Kennedy Onassis. Built in the 13th century, Villa Rufolo’s beautifully manicured gardens and terraces have grand views of the coastline. You could spend hours in this garden, lost in the scenery around you. The villa is open to the public and hosts concerts and recitals throughout the year. A little further up the hill, Villa Cimbrione is famous for its belvedere – the Terrace of Infinity (Terrazza dell’Infinito). This iconic small hotel is known worldwide for the view from its terraces. If you can’t stay there, make a booking at Michelin starred restaurant, Il Flauto di Pan. Less busy than its beachside neighbours, Ravello is home to several luxury hotels and has a quieter, more refined glamor. It’s the place to stay for a relaxing vacation without a beachfront. Once a Roman nobleman’s retreat, Hotel Villa Maria is a peaceful luxury hotel with many famous clientele. Guests return to the hotel for its panoramic sea views, delightful sun terrace and highly rated in house restaurant. If you fancy a dip in the sea, the beach is a 15 minute walk away. Right in the centre of Ravello, La Moresca is a gorgeous boutique hotel with views of the Amalfi Coast. The hotel’s nine ensuite and air conditioned rooms are decorated with locally made Vietri ceramics. Are you looking for a sandy beach spot for your Amalfi Coast vacation? Look no further than beautiful Maiori. With almost a kilometre of wide sand and shingle beach front, Maiori is a popular place to stay for families and those who like to swim and play in the sea. Apart from two very small free beaches, the Lungomare Amendola beach is packed with beach clubs complete with loungers, umbrellas and bars. Perfect for long days in the sun. If you tire of beaching, the town’s medieval streets are home to shops, cafes and restaurants. Popular day trips from Maiori include discovering local grottos, Roman archaeologial site Villa Marittima Romana and nearby foodie haven – Minori. Only a 5 minute walk from the beach, guests at Hotel Club Due Torri enjoy large rooms, many with a private terrace and views of the sea. The hotel offers quadruple and family rooms so it is ideal for a trip with the kids. A swimming pool, restaurant and bar on site are welcome amenities for those wanting to relax. Botanico San Lazzaro is a 5 star luxury boutique hotel only 4 minutes walk from the beach. The hotel has an outdoor pool and private beach with sun loungers free for guests. All rooms at the hotel have a seaview, balcony or terrace. There is a wellness centre on site where you can arrange massages or relax in the hammam. If you want the convenience and space of an apartment, Maiori has some great value options close to the beach. This 2 bedroom apartment is just 50 meters from the sea in the heart of town. Famous in Italy for its fresh pasta, Minori is a food lovers paradise. The small town is known as ‘The City of Taste’ thanks to the pasta, local olive and lemon groves and some of the best restaurants on the Amalfi Coast. Minori has a small beach that can get very crowded in the summer months as it is blessed by full sunlight throughout the day. Fresh sea breezes keep the atmosphere airy though and it is a lovely spot to swim. If you want to do some exploring, you can visit the archaeological site at Villa Romana or hike up to Ravello for its famous views. The local ferries take visitors to the other towns along the coast. When it is time for dinner, Gardiniello has some of the best pasta and seafood dishes on the coast. Dine outside on the terrace covered in jasmine for one of the ultimate Amalfi Coast experiences. Close to Minori’s famous archaeological site, Villa Romana Hotel & Spa is a modern hotel with easy access to the beach. A family run hotel, there is a restaurant featuring local seafood dishes on site and a bar for poolside snacks. Furore is built on the side of a rocky gorge overlooking the dramatic fjord for which the town is named. A very small town, it is really just a handful of cottages and a pocket sized stoney beach. Lemon trees, grape vines and olive groves blanket the surrounding countryside in a typically romantic Italian scene. The bridge soaring 30 metres above the fjord is a wonderful backdrop for photos but is also the venue for the annual high diving competition. It is possible to do several day hikes from Furore, so the village is popular with walker. As it is such a tiny village, most people day trip to Furore. If you are keen to stay in the area this villa with a pool has amazing views out to sea. Otherwise click here for a full range of accommodation options close by. Fishing villages do not get more charming than Conca dei Marini. Traditional whitewashed houses are surrounded by olive and lemon groves and the waters of the Tyrrhenian sea laps at its rocky shores. These days the village is home to several exclusive villas popular with royalty and celebrities due to the remote and picturesque location. Close by you can visit the Emerald Grotto – a cave where beautiful green light bounces off stalactites – and the pretty local churches. Conca dei Marini is a place to escape from it all. Luxury villas are sought after in this area but if you are after something a bit more rustic there are several guesthouses and bed and breakfasts offering good value – >click to browse and several apartments like this one. Recently renovated to a high standard, this lovely villa above the town of Conca de Marini has five bedrooms and bathrooms. As you can see the outdoor swimming pool overlooks the surrounding countryside and turquoise sea. What an idyllic place to spend your vacation. One of the last towns on the Amalfi Coast drive before you reach Salerno, Cetara is a traditional fishing village without pretense. Each night the local fishermen set out into the Tyrrhenian Sea in search of the anchovies that Cetara is famous for as they have done for generations. The town hugs a small cove with a pretty sheltered beach. White washed houses gaze over the scene and lemon groves scent the air. When it is time to eat, Cetara is also well known for its restaurants featuring the local delicacy colatura – the juice of salted anchovies. It is best served as a sauce for spaghetti. Delicious! La Corte dei Naviganti B&B is typical of the type of accommodation offered in Cetara. Simple rooms and generous hospitality are what you can expect if you book a stay there. Staying on the Amalfi Coast was a dream come true for us and we definitely recommend trying to spend at least a night or two at one of the coastal towns if you are in the area. But, sometimes you just don’t have enough time or you want to avoid the crowds and crazy prices common in this area, particularly in summer. Here are some alternative places to stay close to the Amalfi Coast. Technically Sorrento is not on the Amalfi Coast. But its position between the famous coastline, Naples, and the islands of Capri, Ischia and Procida means that it is a popular base for many visitors to the area. The city itself is a modern bustling tourist hub that becomes packed with tour groups throughout the day. If your dream is to experience the true beauty of the Amalfi Coast, Sorrento is not the best place to stay. Sorrento is however a great place to stay for those who have limited time and want to visit Capri, the Amalfi Coast, Pompeii and Herculaneum within a few days. If you’re after some beach time you can certainly find that at Marina Grande and Marina Piccola too. Sorrento is a big living city so if you’re like me (a little nosy) and enjoy watching the goings on of cities, then you won’t get a better introduction to the southern Italian lifestyle. Hint – it’s chaotic, noisy and fun. The city also offers a wide range of accommodation. It is much easier to find budget friendly hotels and places to stay in Sorrento than in Positano or Amalfi. There is a large number of hotels, apartments and guesthouse style accommodations to choose from in Sorrento. We chose those that offered something special. Classic architecture and modern design collide at the Bellevue Syrene. A stunning hotel overlooking the Bay of Naples, all rooms have a balcony to enjoy the incredible views. The hotel has a small swimming pool and wellness center as well as two world class restaurants. 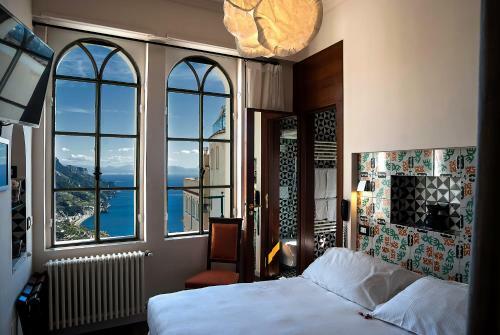 One of Sorrento’s classic hotels, Grand Hotel Ambasciatori has views across the Bay of Naples to Mount Vesuvius. The hotel has a private beach with sunloungers and deck chairs as well as a swimming pool and wellness center. Guests can dine at one of four restaurants and bars at the hotel. The most famous, Restaurant Le Muse serves Italian and international cuisine. A small hotel close to the beach and the Cathedral, Hotel Mignon Meublè is a quiet place to relax after a day of sightseeing or island hopping. 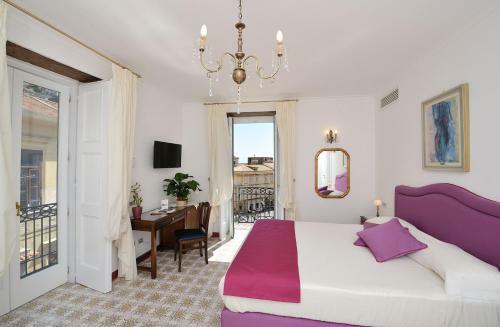 A great value pick if you are visiting Sorrento, the hotel offers a wide range of tastefully decorated rooms. Don’t miss the daily home made breakfast served on the garden terrace before you head out on your adventures. Sitting on top of a hill with views over the bays of Naples and Salerno, Sant’Agata sui due Golfi is a pretty town from where you can also see Mount Vesuvius. We spent some time here last year, attracted by its position close to the Amalfi Coast and easy access to Sorrento, Capri and Pompeii. And its village atmosphere. It’s the type of place where the owners of the local pasticceria give your kids treats and wave ciao. We loved it. Sant’Agata has a reputation for excellent restaurants too thanks to the abundant natural produce of the area. It is home to Don Alfonso 1890 a famous Michelin starred restaurant by chef Ernesto Iaccarino. The restaurant also offers cooking classes. Guest rooms and the hotel’s restaurant overlook the bay and the enticing infinity pool. It is only a short walk into the village of Sant’Agata where you can enjoy the southern Italian village atmosphere. The hotel has a free shuttle bus to Sorrento where you can connect with ferries and tours. We stumbled across Nerano one day when we went exploring from Sant’Agata. This cute as a button seaside town is hidden away between Sorrento and the Amalfi Coast. It’s just how you imagine this region was in the 1950s. There are colorful umbrellas, rustic sea front bars and turquoise waves crashing in onto the pebbled beach. Nerano is not the easiest place to get to but I’m sure that’s the way most people who love the place prefer it. One day I’ll spend a week there splashing in the sea and maybe hiring a boat to cruise along the coast. Maybe. It would be so hard to leave. A modern hotel with colorful flourishes, Quattro Passi Relais is a small hotel with views of the pretty Nerano shoreline. When I discovered that the hotel is also the site of Michelin starred restaurant Quattro Passi, I thought I might move in! The closest international airport to the Amalfi Coast is in Naples. From there you can either hire a car, organize a transfer or take a local shuttle bus to the town you are staying in. You could try to navigate the public transport system – train and bus – but it is a bit tricky and will take 3-4 times as long. We recommend organizing a transfer if you don’t have a car. I am warning you, once you have found your perfect spot on this incredible coastline, you may not want to leave. If, however, you want to check out the other towns and compare them to your idyllic paradise then there are a few ways to do this. Renting a car gives you the most flexibility and ability to reach off the beaten path spots – more on the pros and cons of driving below. SITA buses roll up and down the coast stopping at towns along the way. The main routes are Sorrento – Positano – Amalfi and Amalfi – Salerno. Buses depart at least every half hour. Be warned that the buses are often packed with standing room only (if any) during the peak summer months. You need to buy tickets at the tabaccherie (tobacco shop/news stands). Tickets are not sold on board the bus. Ferries along the coast are a more pleasant way to travel between the towns. There is a direct ferry from Positano to Amalfi where you can connect to ferries to Minori, Maiori and Cetara. Ferries operate during the tourist season from the beginning of April through October. There is no direct ferry from Naples to the Amalfi Coast. You need to change at Sorrento. The absolute best way to explore this region is at your leisure, without crowds and by sea. With twisting and turning narrow roads along cliff faces, the Amalfi Coast road is not for nervous drivers. The road, Strada Statale 163, is known as the road of a 1000 bends. There is also the Italian driving style to contend with too. If you are a confident driver, used to driving a manual or stick shift car and driving on the right hand side of the road, you may actually really enjoy yourself. It is one of the world’s most scenic drives. Having a car means you have the flexibility to explore special places like Nerano that you might miss otherwise. And oh those views! I jumped out of our car several times (even in Positano) for the perfect shot. Be aware that in summer and on weekends the roads are very busy with local day trippers and tourists. In those weeks, taking boat trips along the coast is a better alternative to driving. Also make sure to find hotels and villas with parking on site or nearby as that is not always possible on the Amalfi Coast. The best place to rent a car for the Amalfi Coast would be at Naples airport or Sorrento. We use and recommend Rentalcars.com to find the best car rental deals for travel in Italy and Europe. Lastly, don’t forget to make sure your travel insurance covers your car rental insurance excess. We use World Nomads insurance because you can organize your policy and make claims quickly online. You can read more about what insurance you need for Italy here. Dreams do come true in this part of the world. I will never forget the incredible week we spent in this region exploring its natural and gastronomic treasures. Already plotting our return, I think we’ll be renting a villa near Ravello to soak up that very special Amalfi Coast vibe. Where will you stay on the Amalfi Coast? What a fantastic guide! Love it. It all looks so wonderful and glamorous, I can’t wait to explore Italy a little more. Your photos are so dreamy! The Amalfi Coast has always been a dream destination of mine, and I hope I can visit soon. This information is very useful, I didn’t know there were so many little villages to choose from! Nerano especially sounds appealing to me, I like to get away from the more popular/touristy places. Yes we did! I was determined to see every last inch! Breathtaking! I’m pinning this for future planning. You’ve put together a detailed, helpful post, especially for where to stay. Your warning is fair — the traveler may not want to leave, ever! I would love to spend time in Sorrento and then continue on to Pompeii. This area is almost criminally beautiful. 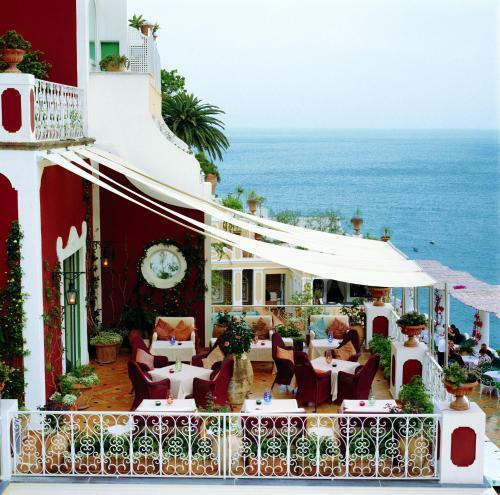 I’m entranced by that terrace in Positano too — I’ve wanted to go there for ages. Definitely pinning this for my Italy inspiration folder! I think you will be in Positano before you know it! Another fabulous travel guide, Katy! I am pinning for later, I adore Italy and we have not visited this destination area…yet. 🙂 I love how you included a map for reference and your suggested audience and activity for the different locations. Haven’t been to the Amalfi Coast since I was a young (poor) backpacker many moons ago. Our accommodations were less than recommendable and I’d love to return with a little better base! So many beautiful options and fab tips. Thanks for sharing Katy, this post is full of such useful information, it’s really handy to know a little bit about the different types of resorts. I’ve never been to this part of Italy and it looks stunning, I’ve pinned it for later.